…and the city replied to the unconventional dance show with an overpowering applause for all the crew! Torino, one of the most crowded and central street, a warm May afternoon, 31 dancers full of energy who entertained the crowd with a complex and articulated choreography: this is the mix of elements which made the two shows extraordinary and surprising. 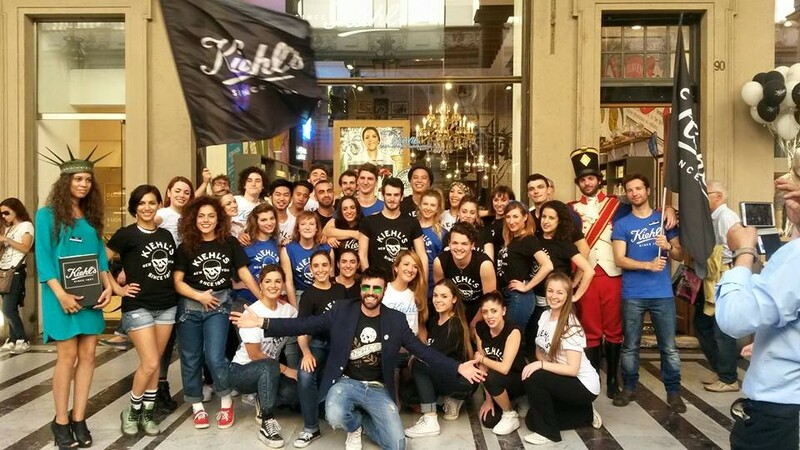 Hundreds of people visited, before and after the unconventional dance shows, the Kiehl’s store, the cosmetics brand owned by the international group L’Oréal, which turned an ordinary saturday afternoon into a special one! Words can’t describe this amazing event, so we prefer let you see the official video that we made in a really short time, that you can find on the Facebook page of Kiehl’s! Thanks to all the artistic staff for the wonderful job and for all the enthusiasm spread during the afternoon, showing once again how any square can become a huge stage. Choreographer and dancer: Eugenio Semeraro. Dancers: Alessia Ferri, Alexandra Wernhard, Angela Tavolario, Annafranca Caruso, Arianna De Rosa, Brando Mercado, Cristopher Pasqual, Davide Venier, Elena Valecci, Eleni Quartana, Federica Tiraboschi, Francesca Dal Lago, Francesca Ruperto, Francesco Maria, Conti, Giorgio Perri, Giulia Maffei, Jacopo Ballabio, Jennifer Mercado, Libe Pozzi, Luca Oliva, Lucrezia Noli, Maria Laura Savio, Michael Missora, Monica Patino, Nicoletta Pane, Olga Nikonova, Oliver Mhark Hizon, Valentina Marmorato, Valentina Paganuzzi, Vincenzo Camardella. Last but not least, congrats to all the technical staff of Flash Mob Milano – Creativi Digitali and PV Agency. Stay tuned 😀 a lot of big news are coming! Sabado 16 de Mayo el equipo de Flash Mob Milano hizo un grande unconventional dance show para la inauguración de la nueva tienda de Kiehl’s en Torino: 31 bailarinos se exhibieron con una coreografía y compleja y encantadora que cautivó la atención de todas las personas presentes en la calle de la ciudad. No hay palabras que pueden explicar toda la energía y la belleza de este show, entonces aquí podéis encontrar el video publicado en la página Facebook de Kiehl’s!